Is this a satin ribbon or a sheer ribbon? Well it‘s both! 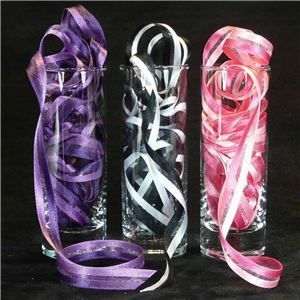 The two outer ribbons are 3mm satin with a 3mm sheer between. This ribbon is truly unique, and is just stunning. A tri stripe made up from 3 different coloured ribbons. 12 mouthwatering colours - Cranberry, Midnight, Chocolate, Cypress, Bridal, Azalea, Grape, Ocean, Sunshine, Emerald, Strawberry and Autumn.